Curbing Malpractices during Holi is our Religious Duty! For Origional Article please vistit: Curbing Malpractices during Holi is our Religious Duty! Celebrate Holi and Rangapanchami in traditional way! The festival of Holi is an invaluable gift given by Indian Sages and Seers to mankind. It is the festival which inspires to increase love and affection among each other, forget all differences and move towards impenetrable God. It is an opportunity to increase our physical health and mental happiness. Recently, citing reasons of deforestation, Anti-Dharmik Organisations like the Andha-shraddha Nirmulan Samiti (ANIS) have been giving wrong advice to the people in society encouraging them to use garbage to light the Holi fire. One should not light the Holi sacrificial fire with garbage, since it pollutes the environment. Rather, if Holi is celebrated with the bhav of worshipping the Deity Holika, the atmosphere will become sattvik. But did you ponder over this? There is wide scale deforestation throughout the year on account of felling of trees for construction purposes, production of paper and other activities which are fuelled by man’s selfish interests. However, so-called environmentalists ignore this and wake up from their slumber to create a hue and cry over the felling of trees on Holi, the occasion of Hindus that is celebrated just once in a year. Their contention is that ‘Trees are cut during Holi, which causes damage to the environment’. They also make fake appeals like ‘One should burn (eradicate) one’s evil thoughts in the fire of Holi’. They irreverently appeal to people to ‘Burn garbage in the fire of Holi’. Hindu Janajagruti Samiti appeals to all Hindus that they should not fall prey to such misguided thoughts and pseudo appeals and should instead celebrate Holi and Rangapanchami with a bhav of worship towards Goddess Holika makes the atmosphere sattvapredominant and use natural colours. Dry wood should be used instead of felling good trees to light Holi fires. Also, the basic objective of celebrating Holi is to forget our differences and come together. If people bear this in mind and celebrate the festival, they can save wood by having just one Holi sacrificial fire for the entire village or locality instead of each group separately burning wood for Holi. When Holi is celebrated, as per traditional practices, it is essential that the sanctity of the religious practice be maintained. 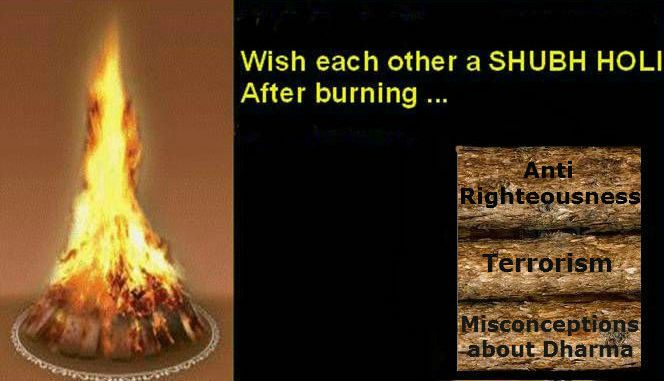 Sanctity will be lost if dirt and garbage is used for the sacrificial fire of Holi. If the directive of the so-called environmentalists to burn garbage in the sacrificial fire of Holi is followed, then poisonous gases emitted by poisonous waste will in turn lead to more pollution. Thus, do not implement such dangerous directives. When Holi is celebrated, as per traditional practices, it is essential that the sanctity of the religious practice be maintained. The sanctity of the festival will be lost if dirt and garbage is used for the sacrificial fire of Holi. The HJS also asserts that why does one need the pretext of Hindu festivals to burn (eradicate) one’s evil thoughts; they (evil thoughts) can be eradicated at every moment, right through the entire year ! Malpractices during Holi – Do not be foes of self and your friends and family, by using chemical colours ! As per Dharma-shastra, ‘Ranga-Panchami’ is celebrated on ‘Phalgun Krushna Panchami’; but at most places, it is celebrated on the day of Holi or ‘Dhuli-vandan’. Earlier, colours used for smearing each other were natural colours; however, the natural colours have been replaced with artificial colours, imposing health hazard for people. In the year 2001, it was observed through research conducted by companies like Toxic Link and ‘Vatavaran’ from Delhi that all 3 forms of colours available these days (i.e. paste, powder and liquid) are dangerous for health. Poisonous chemicals found in paste and its adverse effects are as follows. Colours used in the form of powder have asbestos or Silica which are harmful for skin. In liquid colours, there is gentian violet which can change the colour of skin and pose danger of skin cancer. Dr. Mukul Das, Dy. Director of ‘Industrial Toxicology Research Centre’, Lucknow says that colours used at the time of Holi are mostly made from chemicals and from non-edible materials like cloth, paper and leather etc. All the above chemicals have adverse effect on health. Many vendors sell such colours on which it is clearly written that they are meant for only industrial use; still people play Holi with such colours. It is very harmful for health. Take flowers of ‘Palas’, soak them in water overnight and strain the water in the morning. Add rose water or Kewara essence ‘attar’ for fragrance. Colour obtained from ‘Palas’ removes excess heat from body and protects it from skin diseases. For yellow colour, take a spoon of turmeric, mix it with a bowl of wheat flour/ besan (gram flour) or refined flour. It is good for skin. Use only henna powder or mix with wheat/ gram/ refined flour. Purple colour can be obtained by keeping pieces of beet in water for some time. For shining yellow colour, soak dry marigold flowers in water, overnight and add little turmeric to it in the morning. There is one more method of preparing natural colours. If flowers of ‘Palas’, marigold etc. are boiled in water adding little oil, we get good colours. Have bath with turmeric added to marigold flowers or adding colour of ‘jilebi’ to ‘Palas’ or mix flours (wheat/ gram etc.) . One can rub cow-dung and Gou-mutra (urine of cow) on body while bathing. It helps body to keep away from hazards due to change in season, increases immunity, righteous way of thinking, intellect etc. Do not play with chemical colours and be foes of self, so also of your friends and family. Enjoy Holi festival but avoid hideous exhibition ! Obscene, indecent things happening during Holi festival should be curbed ! For past many years, malpractices are taking place during celebration of Holi festival. These malpractices are harmful to Dharma, culture and society. Hindus should insist and make efforts for stopping such malpractices and celebrate festivals with joy. Hindus should create awareness towards wrongdoings like forcible collection of donations, collecting wood by stealing things etc. Besides, Hindus should also create awareness towards wrong appeals made on this occasion like ‘Holi kara lahan, poli kara daan (have small fire and donate food)’ etc. Celebrate Rangapanchami with natural colours ! Several malpractices, such as the use of dangerous colours containing chemicals that harm the skin, throwing balloons at people which are filled with colours and dirty water, smearing colours on people forcibly, consuming liquor and misbehaving with ladies, eve teasing, fighting, polluting lakes and wells with colours, etc. have crept into the festival of Rangapanchami, which in reality is a blissful event. The HJS appeals to all to prevent the occurrence of such malpractices and celebrate the festival of Rangapanchami in a traditional way using natural colours.- Shri. Ramesh Shinde, National Spokesperson, HJS. 1. Do not apply colours forcibly. Stop people from doing so and give them the reasons. 2. Stop those who extort money from people on the roads. 3. Stop beggars from wearing masks of Deities. 4. Stop people from using excessive colours and hurling water balloons. 5. Do not use harmful chemical colours. These malpractices harm Dharma, and thus, putting an end to them is our religious duty. Spread this word in society and even after doing so, if you come across such incidents, lodge complaints with the Police. Hindu Janajagruti Samiti and Sanatan Sanstha conducts public awareness campaigns in this regard.